Mick Newell has described Chris Read as the ‘heartbeat’ of his team after the Nottinghamshire captain almost helped pull off a dramatic victory over reigning champions Yorkshire this week. The match was eventually drawn but went right down to the final delivery, with Notts needing just one more wicket to win. They’d got into that situation thanks to Read’s splendid second innings century, the 25th of his first class career. 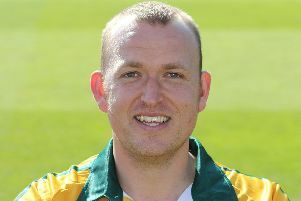 Newell, Nottinghamshire’s director of cricket, said afterwards that he didn’t want to contemplate a time when he couldn’t call upon the services of the 37 year old. “That will be a sad old day because he’s the heartbeat of the team. He gets us out of trouble so many times with the bat and his wicketkeeping is of the highest quality. Read admitted that it had been one of the most dramatic matches he’d ever played in. This coming weekend Nottinghamshire head south to face Middlesex at Lord’s and Read confirmed that’s it’s a fixture he always looks forward to playing in. “It’s always competitive down there. I love playing at Lord’s. The boys will be buzzing to be back down in the big smoke and playing at the Home of Cricket. The Division One table couldn’t be tighter at the moment, with only nine points separating all nine sides but Notts sit proudly at the top, although Newell isn’t reading too much into it just yet. “It’s nice to be at the top, it’s certainly better than being at the bottom – we had periods last season where we were at the bottom.